Surgeons are trained to be precise and effective. Their work demands that they stay alert and perform to the best of their ability. After all, lives may be at stake. But what if they had some help? The kind of help that is reliable and consistent. 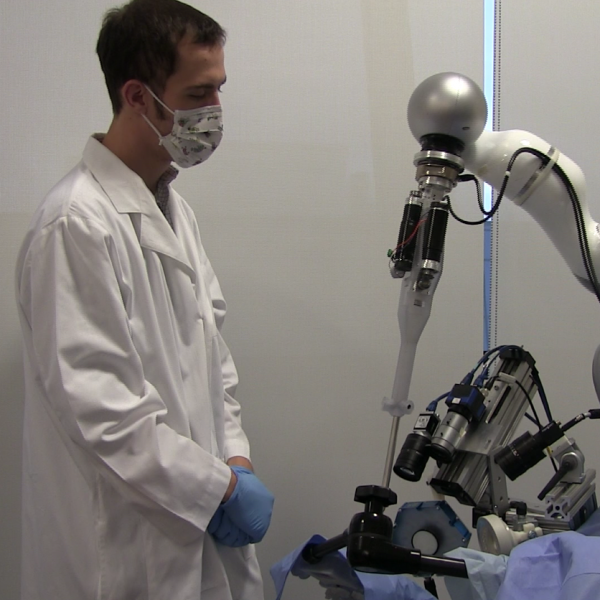 What if they could use a robot to do the incisions and suturing while they monitored the activity? 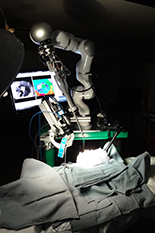 Enter the Smart Tissue Autonomous Robot, or STAR, which has performed better at cutting soft tissue and stitching it up than experienced surgeons, who deviated more from the ideal cut line and caused more char. A few years ago, the STAR proved it could do better than experienced surgeons at stitching together two segments of pig intestine. The stitches were more regular and leak-resistant. The STAR not only has tools for suturing, but also for fluorescent and 3D imaging, force sensing, and submillimeter positioning. It also has demonstrated that it can make precise cuts in irregular soft tissue. The STAR visually tracks its cutting path and cutting tool while adjusting to movement. Using its near-infrared camera, it follows tiny marks placed on the tissue beforehand to keep on track during cutting. In the paper, “Semi-Autonomous Electrosurgery for Tumor Resection Using a Multi-Degree of Freedom Electrosurgical Tool and Visual Servoing” (published last year by the Institute of Electrical and Electronics Engineers), Krieger and other researchers describe the design and integration of a novel, multi-degree of freedom electrosurgical tool for the STAR. They explain how they conducted standardized line tests to determine ideal cut parameters in three different types of porcine tissue. 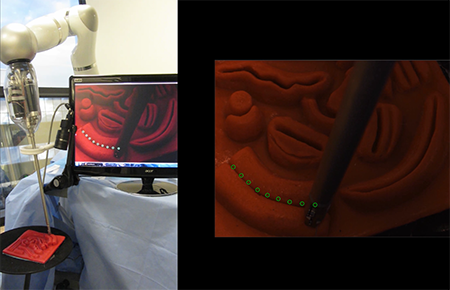 The researchers programmed the STAR with the ideal cut setting for porcine tissue and compared the robot against expert surgeons using open and laparoscopic techniques in a line cutting task. They then performed a proof of concept demonstration using the STAR to semi-autonomously resect pseudo-tumors in porcine tissue using visual servoing. When tasked to excise tumors with a consistent 4 millimeter margin, they found that the STAR can semi-autonomously dissect tissue with an average margin of 3.67 millimeters and a standard deviation of 0.89 millimeters.